This was our best house yet! We have stayed with Cottage Connection for 4 years now, and each time I have been happy with our customer service. Love this log cabin. We have stayed there 4 years now and really have enjoyed every stay. The cabin is not super fancy but that isn't really what I am looking for. It's a nice place that has everything you need and then some. It's nice that every year we go there is improvements and updates done to the cabin. 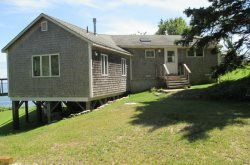 The location is perfect, perfect for enjoying Maine sunsets, and is a very quiet spot. Nice place to unplug from the world. Love the dock and float. The Cottage Connection team was excellent. They responded quickly to the issues that arose and were very pleasant. pam was a pleasure to deal with. She was always helpful. WE loved our visit -- a complete delight, except for the bed! All dealings were pleasant and professional, paperwork was easily done via email. Staff was courteous and helpful, sent a maintenance person quickly when a smoke detector malfunctioned. This was our first time renting a vacation home through a private company. We usually look for a housekeeping cabin or cottage in various State Parks when we travel, but Maine parks don't offer such accommodations. Our experience with Cottage Connections couldn't have been better! Thanks for making our anniversary vacation a great one.